THE Year of Mercy has come to an end, and I want to thank all who helped to make the Jubilee a gift to us all – Pope Francis for offering it to the whole Church, but also the many who have conceived and organised the many activities that have been part of our archdiocesan journey into God’s merciful love. The Jubilee may be over, but we don’t now set mercy aside. On the contrary: in these days of Advent and Christmas we set our sights firmly on the infinite mercy that takes flesh in Jesus. At the heart of Christianity is the claim that God became one of us, which is what we mean when we speak of the Incarnation. In the Prologue of John’s Gospel, we’re told that the Word, who had existed from all eternity, was made flesh and pitched his tent among us. It’s extraordinary to claim that the God whom neither time nor space can contain became a human being at a particular time and in a particular place. But that’s what we celebrate through Advent and the Christmas season. This puts a bomb under any sense that the material world in general and the flesh in particular are bad. In Genesis we’re told that God saw what he had made and found it very good (1:31). Christmas says that God saw what he had made and, seeing its goodness disfigured, decided to become part of his own creation to restore it to the glory he intended from the beginning. The God who takes flesh deals not in abstractions but in facts. Likewise the Church that worships the mystery of the Word-made-flesh needs to deal with facts. That’s where mercy starts. At times what we believe and teach can seem too abstract. That’s the sense I had listening to certain voices at last year’s Synod on marriage and the family in Rome. What I heard at times was logical, perhaps even beautiful in a way, but it didn’t put down roots in the soil of human experience, and it would have been incomprehensible to most people outside the Synod Hall. In 1975, Pope Paul VI said that the split between the Gospel and culture was the drama of our time. In the years since then, the truth of that has become only more apparent. The Gospel and culture have parted ways. The Gospel hasn’t moved but the culture has gone elsewhere in a way that the Church can find difficult to understand and engage. Hence the problems of communication we now face. At times the Church can seem like a teacher trying in vain to communicate something important to students – they just don’t get it and you can see it in their faces. The temptation is to think that if we say it often enough or loud enough they’ll eventually get it. But they won’t. The teacher has to find new words or images, a new language; and if he or she does then the penny drops and you can see that they finally get it. The challenge now is not to abandon the faith in favour of the facts, but to create a new engagement of the faith with the culture of which we’re part – as the logic of the Incarnation demands. That’s not as easy as it sounds because the facts have changed very quickly and dramatically, and that process won’t slow or cease. Part of this new engagement will be a reconsideration of Church structures and strategies, which can be based upon the facts of other times. They may have been brilliantly successful once upon a time when things were different. But they are not what’s required now in a situation where the facts have changed. During the Synod process of 2014 and 2015 Pope Francis invited the whole Church to consider marriage and the family in the light of the changed and changing facts. This is a vital area where the split between the Gospel and culture is perhaps more apparent than in other areas of human life. What the Church believes and teaches and what the wider culture thinks and does have been moving in different directions for some time. The Church can’t just look the other way in the belief that the wider culture is doomed. That’s not the Catholic way. We are a Church who, because we take the Incarnation seriously, take culture seriously and seek to engage it as creatively as we can. This means we have to be in touch with reality rather than inhabiting some abstract world which can produce what the Holy Father has called “dry and lifeless doctrine” (Amoris Laetitia, 59) and “a cold, bureaucratic morality” (Amoris Laetitia, 312). At times the facts can seem unfriendly to Catholic belief and teaching. But according to psychologist Carl Rogers, “The facts are friendly” – by which he meant something like “the truth will set you free” (John 8:32). The question for us is, How might unfriendly-seeming facts actually be friendly? Or to put the question differently, Where is God in the midst of the mess? The real God is there somewhere, somehow; but it’s a challenge to discern God’s presence when the facts seem not just messy but unfriendly. Pope Francis has spoken often of the need for the whole Church – not just the pastors – to undergo “a pastoral conversion”. The word “pastoral” can mean many things, but it doesn’t mean that we compromise the truths of the faith. It does mean however that we get in touch with the facts of human experience. It means that we, like God, abandon the world of abstraction to engage the real lives of real people in the ways traced by the Pope’s apostolic exhortation, The Joy of Love. This will mean a new kind of listening to the truth of people’s experience. From a new listening will come a new language that people can understand because it’s in touch with their lives. That’s what it means to be a truly pastoral Church. It’s also what it means to speak of a new evangelisation by a more missionary Church. Advent is a time of waiting, but there’s nothing passive about that, because we wait with ears and eyes wide open. 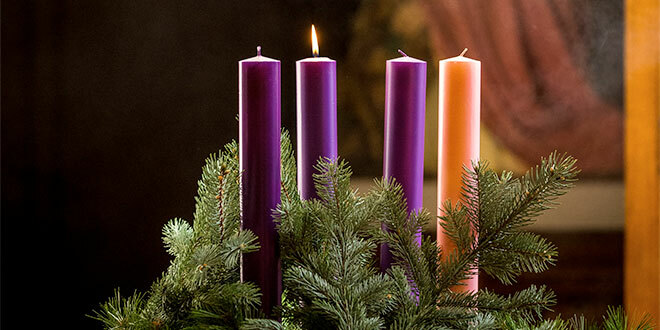 Advent is a special time for listening. It’s also a special time for seeing – scrutinising the signs of the times, asking ourselves in the light of the Incarnation how the facts, which can seem unfriendly, might actually be friendly with the friendliness of the God who becomes one of us so that mercy may have the last word.